Over 25 Different SHAPES & SIZES to Choose from! • Made from a special grade of rugged high density polyethylene. 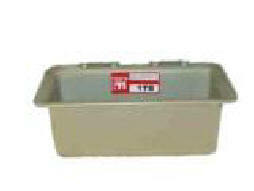 • Provides a safe and convenient storage space for TOOLS and CATV meters. • Fit virtually every aerial lift basket. • 1TB-RA, 1TB-RT and 1TB-S will fit round buckets. • Custom colors available. Call our Sales Department at 603-645-6800 for details. 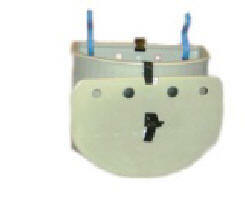 • PTI Brackets are designed to mount on buckets with or without liners. • Permanent non-conductive fasteners available, order PTI Model NSK-6 or NSK-8. • Rugged polyethylene is impervious to motor oil, hydraulic oil, and a broad range of chemicals. The WMTB has a tray/table that will accept Splicer units. 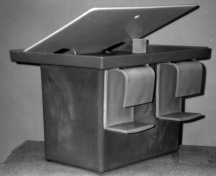 Model 1TB-SA has straight back hooks on the inside of the bucket. Our Model 2TB is twice the width of the 1TB to hold twice as much. Great for holding lighting components like Street Lights or Traffic Lights. Any Tool Tray can be ordered with a divider. Ask our sales department for details. A soft cover is available to fit many of our trays. Our 1TB-RA model fits curved baskets with a 30" -32" diameter such as 1996 and older Altec round splicing buckets, Time/Versalift, MTI/General Cable and many other round buckets. Also available is the PTI 1TB -RT which will fit the Telsta Round Buckets. Deep Poly Tool Tray w/ Tool Magnet 24"
** Made of a rugged polymer blend making it impervious to motor oil, hydraulic oil and a broad range of chemicals. 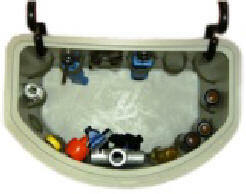 The PTI tool tray, as with all PTI products has been designed with the lineman's needs in mind. It is built to withstand the harsh environments that linemen are subjected to on a daily basis, combining storage needs and durability in one great product! This tray is extra deep at 24". ** Made of a rugged polymer making it impervious to motor oil, hydraulic oil and a broad range of chemicals. 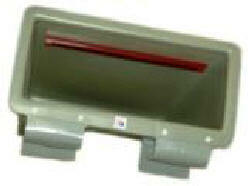 The PTI tool tray, as with all PTI products has been designed with the lineman's needs in mind. It is built to withstand the harsh environments that linemen are subjected to on a daily basis, combining storage needs and durability in one great product! ABH Hooks Included. Soft and hard covers are available.